We are desperately reaching out to you in hopes that you will find it in your hearts to shine the spotlight on a barbaric and inhumane issue that is torturing & stealing the innocent lives of countless man's best friend - an issue called the "DOG MEAT TRADE"
There are so many voices already speaking out against this issue, but unfortunately many of these voices are going unheard & their attempts going unseen -- and it is truly important to have media involved so that more innocent lives will be saved and eyes opened to what inhumanity is happening in the world, and doesn't life deserve to be looked at as part of the world, and not what we can subject them too for our own inhumane reasons? 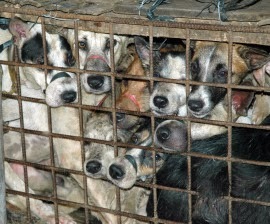 The unspeakable cruelty that these innocent dogs go through on a daily basis is unimaginable - being constantly beaten, skilled & many boiled alive -- all due to a sickening theory that this form of abuse supposedly tenderizes the meat, creating a false belief that the adrenaline being released during their painful death enhances flavor. How can we consider this act of torture and suffering Normal, or allowed to continue? we wouldn't consider these actions normal or permitted to go on if they were happening to humans - so what makes animals any different, for they feel as we do, and are living beings as we are -- and yet their cries/pleas are continuously ignored by many, because in the eyes of some humanity, animals are here for our purposes and not their own. We understand that there are so many other issues throughout the world - but we must not forget the issues that are affecting animals, issues that are slowly being passed to our future, and growing at a rate that if nothing is done,will forever stain our beautiful world. It is our responsibility as humanity to be guardians for life - to be role models and educators, to represent respect and compassion - to educate, encourage and empower, and we hope that you will take part in spreading the word and being part of the action to change the laws within these countries that permit these inhumane actions and make it illegal through new clearly enforceable laws which will prohibit the trafficking of animals for the meat trade, ban the torture, abuse & slaughter of man's best friend, define these animals as companions and not "menu items" .. Together we can make a difference - As a compassionate World, humanity, and souls - the time to act is now for a solution. Will You Raise Ur Paw?